KALIHI — The Monarchs' three-year state tournament drought is over. 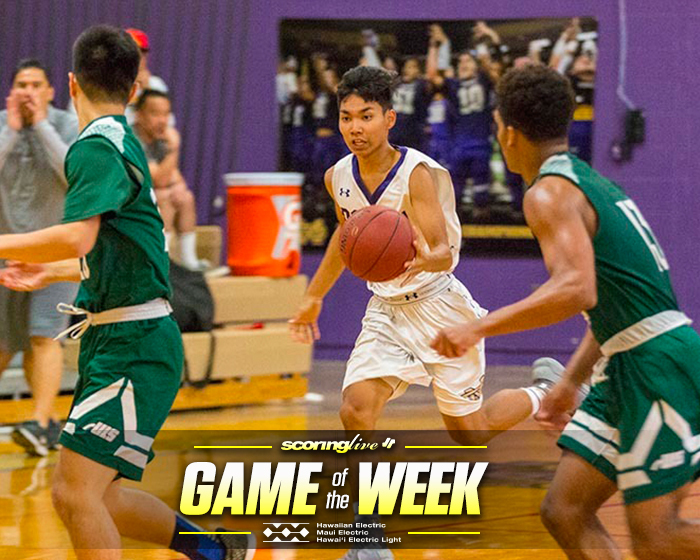 Damien nailed late free throws to roll past visiting University Lab, 57-44, in the Interscholastic League of Honolulu Division II single-elimination tournament final Saturday afternoon to clinch the league's second and final ticket to the state tourney, which starts on Feb. 14. The Monarchs finished the ILH season on a four-game winning streak to improve to 9-3 as they earned their first state berth into the Snapple Division II Boys Basketball Championships since 2015. "I'm proud of this team and our young guys and we worked really hard for this," said senior guard Kolin Galdiano. "I'm proud of these boys and we've been through so much the last two weeks," added Damien coach Alvin Stephenson. "You saw their heart, soul, passion and pride, they wanted to show people they can do it. They believed in each other." A trio of Monarchs scored in double figures led by Galdiano with 15 points. Lindon Sevilleja added 12 and Crumel Mooring chipped in 10 points, five boards and four assists. The Jr. Bows, who last made it to the state tournament in 2016 where they won the state title, saw their season end with a 7-5 mark. "They were able to clutch up in the end and that's what matters," University Lab coach Ryan Tong said of Damien. "Unfortunately free throws were an achilles' heel. Tough games like this you need every point you can get." The Jr. Bows' starters, who scored all 78 points in their semifinal win over the Eagles, scored 40 of their 44 game points. Otto Taylor led the way with 17 points and shot 8 of 13 from the free throw line and Ryder Rebibis added 11 points and a pair of triples in the loss. "We had to get in front of him and clog the lane so he doesn't get easy buckets," said Galdiano, on slowing down Taylor, who scored 22 points in the semis. University was 4 of 19 from the 3-point line and shot 15 of 35 from the field overall. "We had to knock down some 3's because they were giving us open looks, but weren't able to cash in," said Tong. The 78 points put up against HBA caught the eye of Damien, who had to slow down the game to make the Jr. Bows work for their offense. Leif Fautanu, who scored 20 points off putbacks against HBA, was held to seven points and 10 boards on Saturday. "We knew they wanted to get the ball into Leif (Fautanu)," said Stephenson. "We figured if we can neutralize them and we'll be in good shape and Otto is going to get his. We had to get them tired and worn out and we'll take our chances in the last two-three minutes." "We scouted them and see what their strengths were," Mooring added. "We denied that and that's why we played zone against them because of their amazing players in Otto and Leif." The Monarchs outscored the visitors, 15-4, in the final three minutes of the game. The Jr. Bows sent the Monarchs to the line and Damien shot 15 of 20 (75 percent) from the free throw line in the fourth quarter, and made 11 of their 14 attempts the final minute and 45 seconds. It shot 21 of 32 (66 percent) overall. "We shot free throws well in this game," said Stephenson. Taylor tied the game at 8 with a 3-pointer, but Jydon Hall picked off a long inbounds pass and was fouled on the layup. He made both free throws to give the Monarchs a 10-8 lead after the first quarter. Both teams couldn't get shots to fall and combined to shoot 8 of 17 from the free throw line in the next period. Dorien Penebacker made back-to-back jumpers with just over three minutes in the second quarter. Josh Awai got his layup to drop in transition for the Jr. Bows' first field goal. Taylor followed up on his own miss and converted the putback before the buzzer as University trailed, 20-18, at halftime. Rebibis tied the game at 27 with a 3-pointer and took the lead for the first time on Colby Chun's steal and layup in the third. Mooring was whistled for a technical foul and later picked up his fourth foul not long after. "I knew it might've been our last game," said Mooring, on regaining the composure. "I had to listen to our coaches and they were saying, ‘discipline'. At the end, I listened to what they were saying and we executed the game plan and it worked out." The Jr. Bows would retake the lead, but Galdiano tied it up with a 3-pointer and Penebacker banked in a layup before the buzzer to give Damien a 34-32 lead going into the fourth. "The ball movement was crucial and we had to find open spots on the floor and keep shooting it," said Galdiano. Taylor got to the line six times in the fourth quarter, making three of his free throws to keep the Jr. Bows in it and Rebibis added a jumper for a 36-35 lead. "I thought Otto did well with penetrating and being aggressive, but we were cold from the outside," said Tong. The Monarchs tied it up on Emmanuel Stevenson's free throw and Sevilleja's dribble-drive gave Damien a 40-38 lead. Rebibis pulled University within four with a left-corner 3-pointer, but Damien made their final 11 free throws to put the game out of reach. "It comes down to knocking down open shots and we had a lot of looks. We had a lot of untimely errors down the stretch that killed us and we weren't able to knock down free throws and that's what it came down to," said Tong. The teams split the season series with the Jr. Bows winning 42-40 on a last-second layup back on Jan. 16, but the Monarchs got their revenge winning the season finale, 56-53 on Feb. 1.